I am a Secondary English Education major at Kansas State University. I was born and raised in Wichita, Kansas, attending school in the USD 259 school district where I attended and graduated from South High School. While attending Wichita South, I was an AVID student, football and wrestling captain, and Titan of the year. Deciding to continue my football career, I accepted a scholarship offer at McPherson College where I served on the student council, was a student ambassador and a full time student athlete. After major program overhaul, I decided that my education was more important than football leading to my decision to transfer to one of the greatest schools in the country, Kansas State University. Here at Kansas State, I have had the honor of serving as a Bill Snyder Leadership Legacy Fellow, continually building my leadership skills and impacting the community through working with many diverse individuals and spreading my positivity and experiences with those same people. My Kansas roots are near and dear to my heart as I still believe in integrity, humility, hard work... and the Kansas City Chiefs. 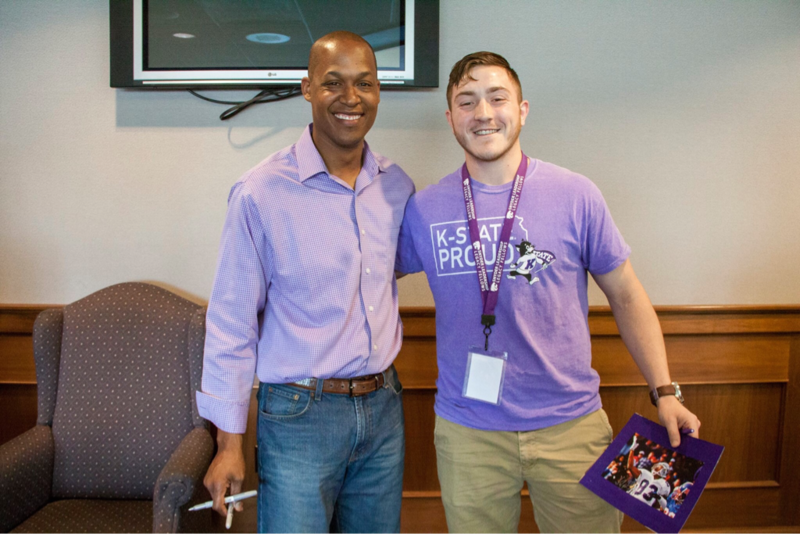 With former Wildcat and Chief wide-receiver Kevin Lockett, father of former K-State superstar and current Seahaws wide-receiver Tyler Lockett.